I feel as though we have been light on the admissions around here so thought it was a great time to admit to you all that we are a sweet house. At times I wonder if our house has more sweets than proteins. We love cookies, cakes, brownies, and any combination of those that a person can dream of. In our constant pursuit for healthier versions of the snacks and treats that we love so much we were given the opportunity to sample a couple of Enjoy Life Food’s cookies. We sampled the Soft Baked Snickerdoodles and the Vanilla Honey Grahams. Let me start by saying that the products featured in this post were provided to me free of charge courtesy of Enjoy Life. This post may have affiliate links but this in no way will influence the review to follow and all opinions are my own. Enjoy Life Vanilla Honey Graham Crunchy Cookie, 6.3-Ounce (Pack of 6) – I am a lover of graham crackers, and vanilla – quite honestly I can think of no better flavor combination. These Vanilla Honey Graham cookies were crunchy and full of flavor. The package had about 16 cookies that were about 6 cm in diameter. These were so good that is easy to forget they are healthy for you. Enjoy Life Soft Baked Snickerdoodle Cookies, 6-Ounce Boxes (Pack of 6) – I had never tried a store-bought Snickerdoodle before and had always made my Snickerdoodles from scratch. These were soft baked cookies, came 12 cookies that were about 2.5 inches in diameter. The cookies were moist, and chewy and tasted closer to homemade then store-bought. The best part about these cookies is what they are missing. The items they are missing range from dairy, nuts, gluten, wheat, and the cookies are certified kosher! These cookies are good for you and taste like the are not, I encourage you to give these a try for yourself! To learn more about Enjoy Life Foods, click here. To purchase more Enjoy Life Food’s Products, click here. GIVEAWAY: Enjoy Life Foods is offering a box of each of these cookies to my readers! Open to residents in the US only. I will be randomly choosing 1 person on June 15 (6/15/2015) to receive these cookie boxes! To enter complete the entries below! Winner will be notified by me by email and prize will be fulfilled by Enjoy Life Foods! Remember you have 48 hours to claim prize, or I will chose another winner. GOOD LUCK!!! 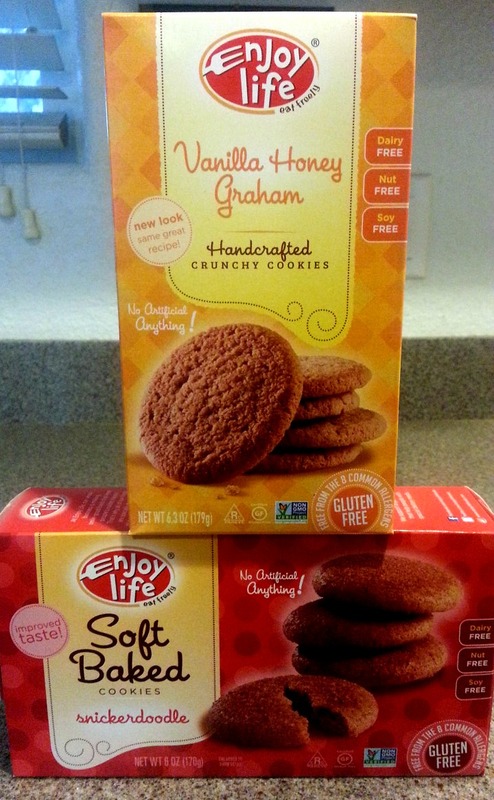 Win a box of Snickerdoodles and Vanilla Graham’s from Enjoy Life Foods! This entry was posted in Food and Drink Products, Giveaways, Gluten-Free, Reviews and tagged cookies, craft snacks, Food Review, product review, snacks on May 29, 2015 by Jennifer. These were one of the best Snickerdoodles I have ever had! They were so good, if you like Snickerdoodles and Graham Cookies, you will love these! Hi David and Christine, my name is Jason. I am Jennifer’s husband, I am pretty picky about my snicker doodles. My mom spoiled me growing up, grin. They are much better than I would have given credit for. I’ve been wanting to try their chocolate chocolate chip cookies for ages now. I’m pretty obsessed with their chocolate chips and chocolate chunks. They’re meant for baking but I pretty much just eat them straight. It’s hard to find allergen free chocolate!! I would love to try the snickerdoodles! I would like to try the mixed berry bars and the plentils chips. I’d like to try their chocolate chips again. It’s been a while since I’ve had some! I’ve love to try the Sugar Crunchy Cookies. I would love to try the double chocolate brownie cookies. They sounds so delicious! I’d like to try their ricemilk chocolate. I’d love to try the vanilla honey grahams! I love anything with vanilla in it. I’d love to try the Dill and Sour Cream Plentils! I want to try the Snickerdoodles, because they’re my favorite kind of cookie. I want to try the snickerdoodles! i really want to try the snickerdoodles! I would love to try the brownies yum! I want to try the snicker doodle cookies. I would really like to try the vanilla honey grahams. The Sunbutter crunch bars for me, they look awesome!